Five of the six Democrats campaigning for the 10th District seat in the U.S. House of Representatives met at the Ashburn Rotary on Thursday for what club President Ken Courter said was a first. Courter said the Ashburn Rotary had never hosted a candidate forum before, and said the event was not partisan. “What are the top qualities of a leader? Honesty, compassion, integrity, confidence, flexibility, learning to work with others. 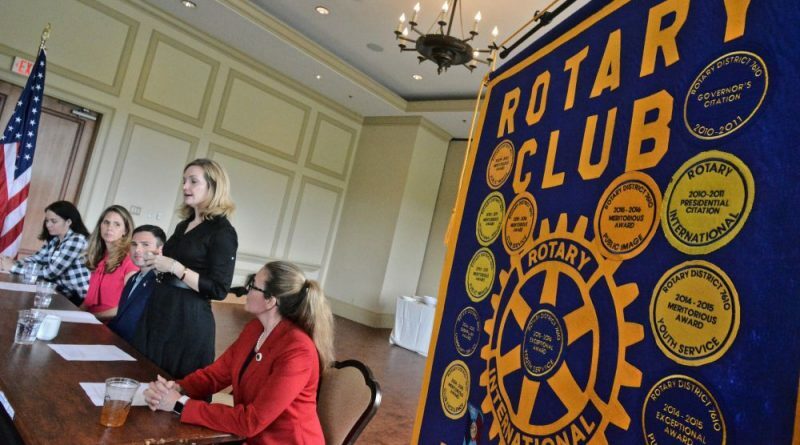 And in Rotary we do that,” Courter said. Julia Biggins, Alison Friedman, Dan Helmer, Lindsey Davis Stover, and state Sen. Jennifer T. Wexton (D-33) gave Rotarians brief arguments for why they are the candidate to elect—and the candidate to beat incumbent Rep. Barbara Comstock (R-VA-10). “I think a candidate in sharp contrast is the way we need to go to defeat Barbara Comstock in the fall, and so when you cast your ballot, I ask you to consider casting a vote for the first woman scientist to ever serve in the House,” Biggins said. She focused on single-payer healthcare, universal pre-kindergarten education, green energy, and a national gun buyback program. Nonprofit executive and former Obama administration official Alison Friedman said, “I am not a typical candidate, but these aren’t typical times.” She referred to the Rotary “Four-Way Test,” which asks whether statements and actions are true, fair to call concerned, build goodwill and better friendships, and are beneficial to all concerned. She said President Donald J. Trump and Congress are not meeting that test. She stressed her support for campaign finance reform, expanding healthcare access, and investing in businesses and communities. “I’ve seen firsthand the consequences of Washington cowardice,” Helmer said, referring to his Army experience. “It’s inscribed in the headstones of friends.” He focused on his family’s history of immigrants and Holocaust refugees to the U.S., expanded healthcare and pushing back against the National Rifle Association. Like other candidates in the race, Helmer said he has not and will not take money from corporate political action committees. And Wexton, the only person in the group with previous election experience, pointed to her record in the General Assembly. “It turns out I’m pretty good at it,” Wexton said. “I’ve passed over 40 bills despite being in the minority.” Wexton came to the forum less than 24 hours after voting to expand Medicaid in Virginia. “With Donald Trump in the White House, with agency heads like Scott Pruitt at the EPA, with agency heads like Betsy DeVos at the Department of Education, people who are hostile to the very agencies and the rights they’re supposed to protect, I know it’s time to step up again, because I know that we’re better than this,” Wexton said. Comstock faces a primary challenge from the right from Shak Hill. Voters will pick the Republican and Democratic candidate in the June 12 primary.